I couldn’t resist getting a bunch of watercress when I saw them this morning at a local supermarket. Sold in wet markets and supermarkets, watercress is packed with anti-oxidants and vitamins. 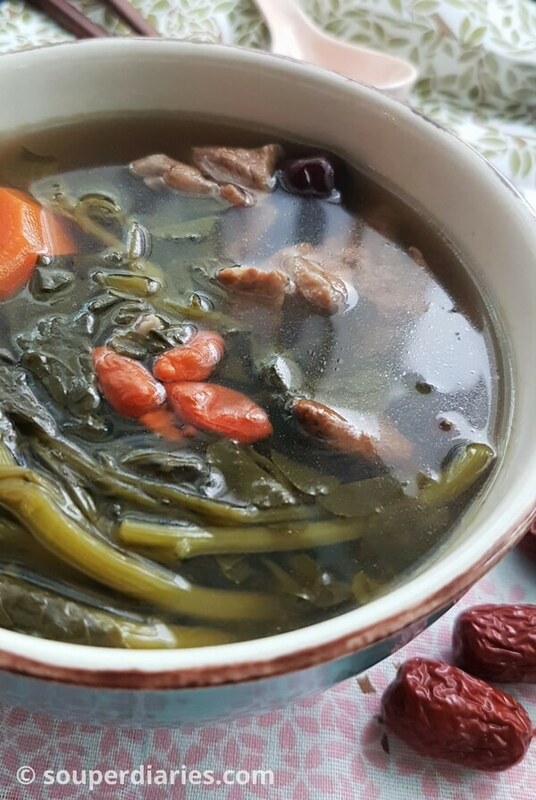 This watercress with pork ribs soup (西洋菜汤) is not only tasty but it is very nutritious as well. Watercress is a semi-aquatic plant often found growing in slow-moving water such as streams and springs. Raw watercress has a bitter, slightly peppery taste which I don’t particularly enjoy while the cooked ones have an earthy flavour to it. The health benefits of watercress include cancer prevention, lowering blood pressure, maintaining healthy bones and treating diabetes. It is often consumed to cool down our bodies in hot weathers, making it a good soup to have every now and then. Some people enjoy very soft watercress while others prefer it with more bite. Add the watercress into the soup during the last half hour of cooking if you’d like them to have more ‘bite’. Watercress soup is very popular in many Chinese soup stalls in Singapore. 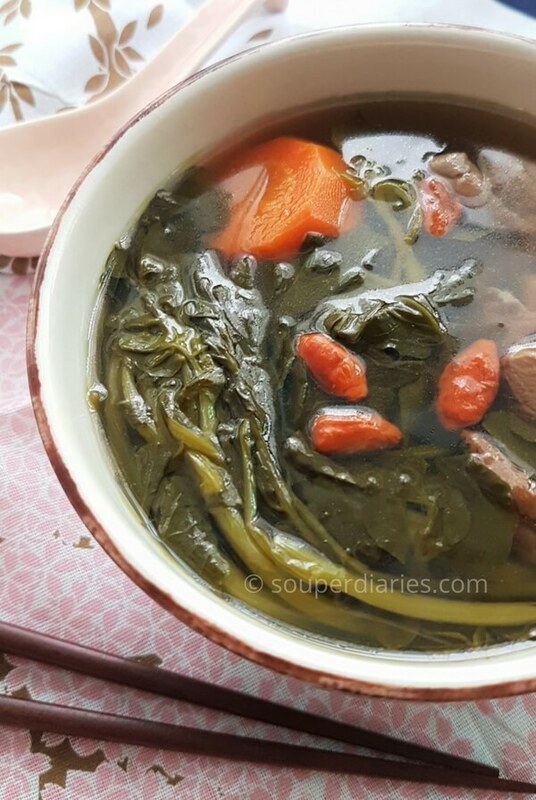 This refreshing and nourishing soup is an oldie-but-goodie in many Chinese households as well. The dried honey dates amplify the sweetness of the soup and I also added some dried oysters for an extra depth of flavour. 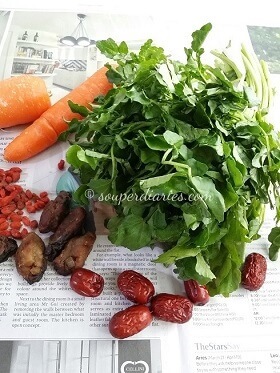 The watercress will shrink after boiling them for some time so it’s best not to use too much water in the beginning for this watercress soup recipe. This soup is practically a meal by itself; and also pairs perfectly with a bowl of freshly cooked plain rice. I am happy to have this soup with just rice alone. One thing that I always do when having soups is to have some light soy sauce on the side to dunk the tender pork meat. It’s absolutely yummy! 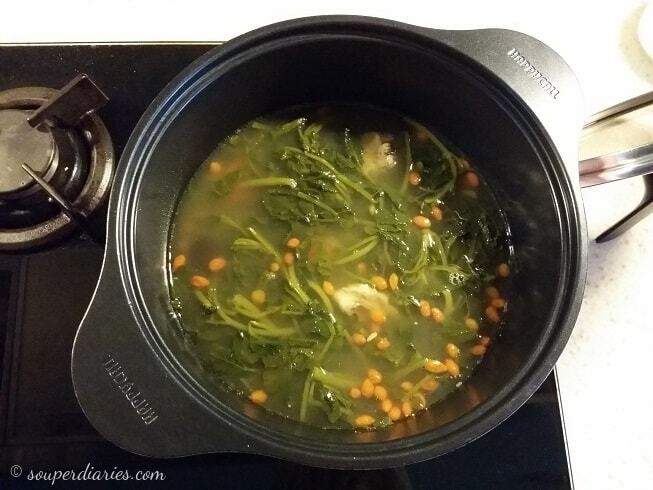 I love using my Happycall alumite ceramic pot for many of my soups and everyday cooking. Stylish yet practical, it is one of my best kitchen investments. Read the review here. Watercress soup can help alleviate dry coughs, sore throats and irritability. A cooling and nutritious earthy soup. Blanch the pork ribs in a pot of boiling water for about 5 minutes to remove surface scum. This process makes for a clearer soup. Remove, rinse and set aside. Transfer all the ingredients into a soup pot and bring to a boil. Once it is boiling, turn to the lowest heat and simmer for about 1.5 to 2 hours or until pork ribs are soft. 1. You can substitute pork with chicken meat or chicken carcass or even a mixture of both. 2. Add in watercress about an hour into the cooking time if you don't want the watercress to be too soft. Leave a comment or share a photo on Instagram with the hashtag #souperdiaries. I’d love to see what you come up with! I’m so glad I came across your blog! We love soups, but not the American type. I like Chinese soups a lot, but have never made this one before. I’ll have to try it! I’m printing it right now! I might be substituting the pork with chicken though. And I’ve never made soup with dates before, but I’m gonna try. I like trying new things. I usually make Romanian and Italian soups. Hi Claudia, I hope you’ll like the soup. Do let me know how it turns out or if you have any questions.